Number twenty-two embodies the qualities of a double dose of a new creative resistance and a mobility to support structural reinforcement. Since number twenty-two is part of a new cycle, far removed from the single-digit number two and includes number twenty, the newly formed entity embodies slightly different properties than any single-digit number by itself. This number strengthens and enhances through a complementary function, as we see it in human extremities of two arms and two legs, which serve functions of mobility, movement and progress on a larger scale. The inherent properties of number twenty-two relate to the purely physical plane. Just as hands/arms and legs/feet accomplish tasks of mobility and material reinforcement through teamwork, this number supports theses specific objectives on the material plane by means of regulatory functions with other objects. This number communicates with the outside world and the influence of this number is directed toward the materialistic sphere. It changes the object's physical conditions for better use. Its influence is mobility and improvement of structural strengthening on the material plane. Mathematically, this number has some unique traits: 22 divided by 7 approximates the irrational number Pi (π). The result of the division results in 3.142857..., whereby the six decimal numbers repeat themselves infinitely after number three. Contrary to number Pi it's a repetition of six decimal numbers. A circle divided by just six straight line segments can have only 22 sections created that way. Patterns always give us some important cues. Here we have a limited pattern that is not part of a complex array, as manifested by life. It is obvious that it is a structured pattern, often found on the purely physical level. The number 22 and 7 seem to have some kind of strong physical affinity. The element titanium with proton number 22 is the only element that burns in nitrogen, which has proton number 7. Within Pi the number 7 and 22 are bridged by 121 numbers. Both numbers, 22 and 121, can be reduced to the single digit number 4 (2+2=4; 1+2+1=4), which emphasizes the qualities of building something tangible through a logical structured system. 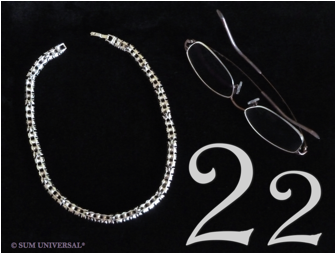 The chemical element that correlates with number twenty-two is the element titanium, which is a soft, ductile, lightweight and silvery-white metal of low density and high strength. It is the ninth most abundant element in Earth's crust and is found always bonded to other elements in nature and is present in a number of mineral deposits and many iron ores. It’s a paramagnetic metal and a poor conductor of heat and electricity. Other unique properties include excellent fatigue and corrosion resistance in all natural water, saltwater environments and chlorine, which makes it an ideal candidate for being used in propeller shafts, rigging and other parts of boats that are exposed to sea water. In addition, Titan seems to be the only metal completely resistant to all forms of biofouling corrosion. Its position in the periodic table is in group four, as well as in row four. Titanium has a high reactivity toward oxygen, nitrogen and some other gases. Titanium’s metal surface oxidizes immediately upon exposure to air and forms an adherent, non-porous protective layer of titanium oxide (TiO2), and this thin passivating (chemically inert) layer of oxide protects the interior of the metal under normal temperatures from further oxidation and/or contamination. In its compound form of titanium oxide (TiO2) it serves as the most common white pigment of paint in the world. Since it is considered to be physiologically inert, it is permitted as an additive in food and pharmaceutical products, and is used in toothpastes, cosmetics and sunscreens, and even as a food coloring agent. Titanium can be present in its compound forms in four oxidation states (+4, +3, +2, +1), but the +4 and +3 state are the most common. Another special characteristic of titanium is that it burns at a temperature of 800 °C (1,470 °F) in an atmosphere of pure nitrogen, which is largely an inert gas, to titanium nitride (TiN), having a hardness equivalent to sapphire and carborundum, and therefore is used to coat cutting tools, such as drill bits, and other precision metal parts. As a coating, it is used for a variety of consumer products, industrial products and in the aerospace industry. And because of the metallic gold color of TiN, it is used for decorative purposes such as coating of car accessories and fashion jewelry. Titanium metal can have two allotropic forms. At normal temperature pure titanium exist in a hexagonal close-packed form (hcp), called the alpha (α) phase, and undergoes at a temperature of higher than 882 °C (1620 °F) an allotropic transformation to a body-centered cubic form (bcc), called the beta (β) phase. The different physical properties of the titanium’s allotropic forms are utilized in the alloying process with other metals such as aluminum, molybdenum, and vanadium. These alloys whose properties are low-density, high-strength, resistant to corrosion and high temperature make titanium alloys useful in a myriad of industries including aerospace, military, and sporting goods. Other uses are for dental and medical instruments, artificial body parts, such as hips, pins for setting bones and for other biological implants because it does not react within the body and is not rejected by the body. Since titanium is hypoallergenic and of light weight, it serves for the production of jewelry and other consumer goods, such as eyeglasses frames.